Galicia is home to a dozen great Paradores. 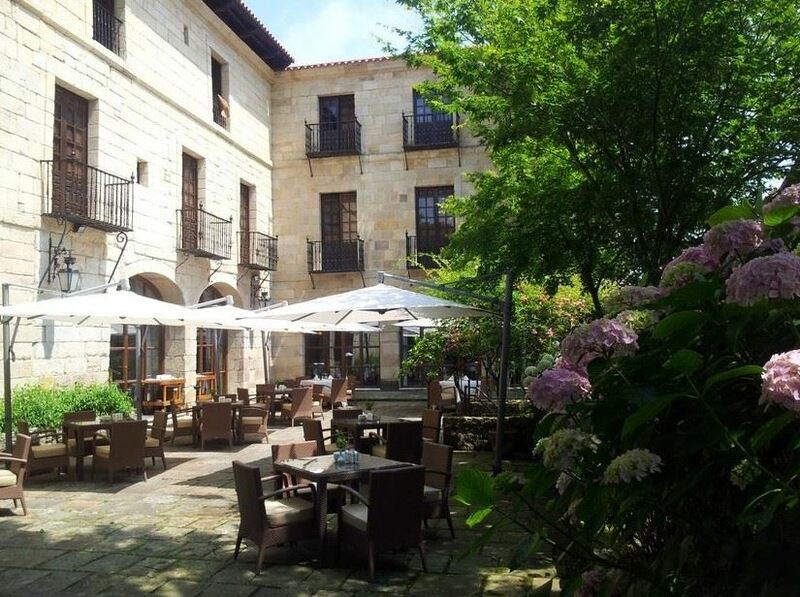 We adore the Hostal Dos Reis Católicos in Santiago de Compostela and the Santo Estevo in Ourense has some pretty amazing views from the terrace off the dining room but if we had to choose just one, it would be the Parador de Baiona in Pontevedra. We’ve placed a number of just-marrieds there – you can read about one couple here. What’s so great about it? The sea views for starters. The former fortress on the Monterreal Peninsula was a gateway to Americas. It looks out onto the Atlantic and you can see the famous Cies Islands in the distance from here. 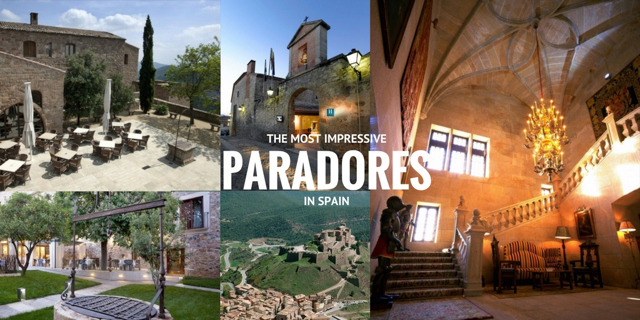 The Parador has seen its share of action offering shelter to the Moors, a few emperors, the Cistercian and Franciscan monks, the Duke of Lancaster and even Drake was here. If the sea beckons, you should seek out the many cliffside walking trails or hire a boat and sail over to the Cies. If you prefer terra firma, you should explore the nearby fishing village of A Guarda and visit its Celtic settlements. Foodies will be keen to enjoy the seafood (clams, oysters, scallops, shrimp, crab and octopus) and local wines served at the Parador and the many bars and restaurants by the coves and beaches nearby. If you like visiting wineries, you are in the Rias Baixas – one of Spain’s most fashionable white wines – which goes extremely well with the aforementioned seafood. Read about the Rias Baixas and Galicia in our guide to the region here. Asturias in Northern Spain is another spot where we place our people in Paradores. 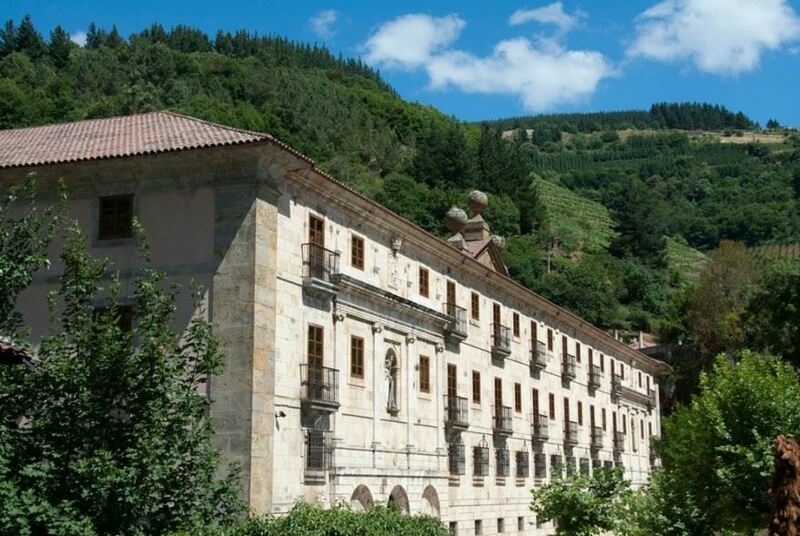 The Cangas de Onís Parador is a very popular hotel but our tip for ‘most impressive Parador’ is the Corias Parador that won the Conde Nast Traveler award in 2014 for the best rural hotel in Spain. What’s so great about it? 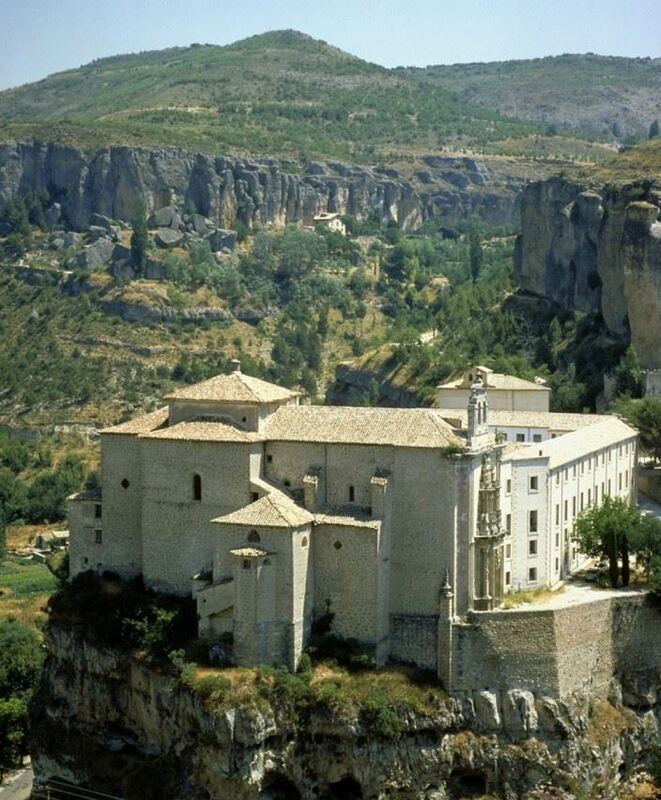 It’s known as the El Escorial of Asturias – so the name alone makes it worth a visit. The monastery has been declared of National Historic Importance and it’s location in a valley of green overlooking the Narcea River is pretty special. Inside, you’ll be swayed by the Toscan styled chapel not to mention the museum plus the 11th century archaeological remains of the first structure visible from the basement. If that isn’t enough, visit the Roman bridge outside and follow the trail to many national parks and reserves here. This is grape-growing territory too – so make sure to try the fruits of the vine when you are back at the Parador. After the walk or hike, you should relax in the Parador’s spa and indoor swimming pool before sampling some of Asturias’ great cuisine in the wonderful restaurant that used to be the refectory. To read more about this region, you can review our trip to Asturias here. 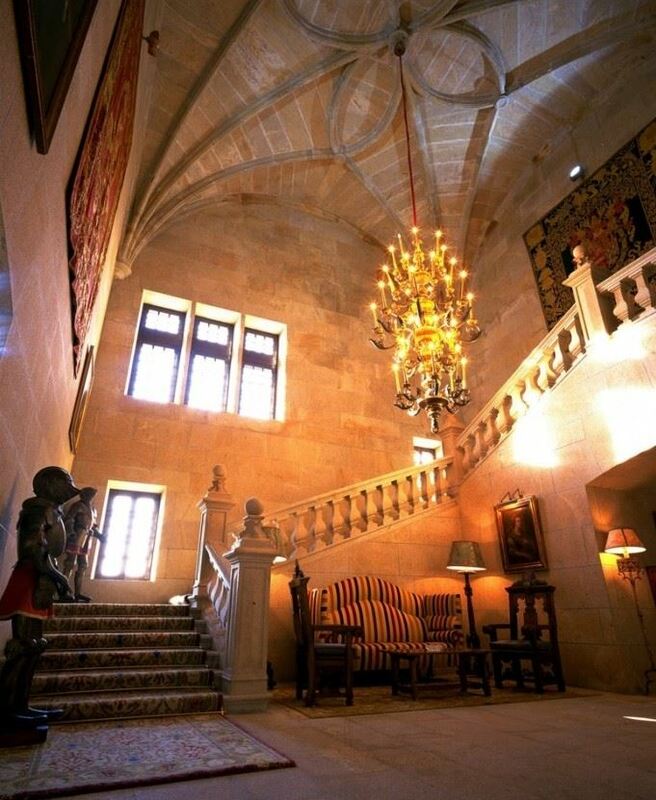 Cantabria’s best known Parador is the Santillana Gil Blas. 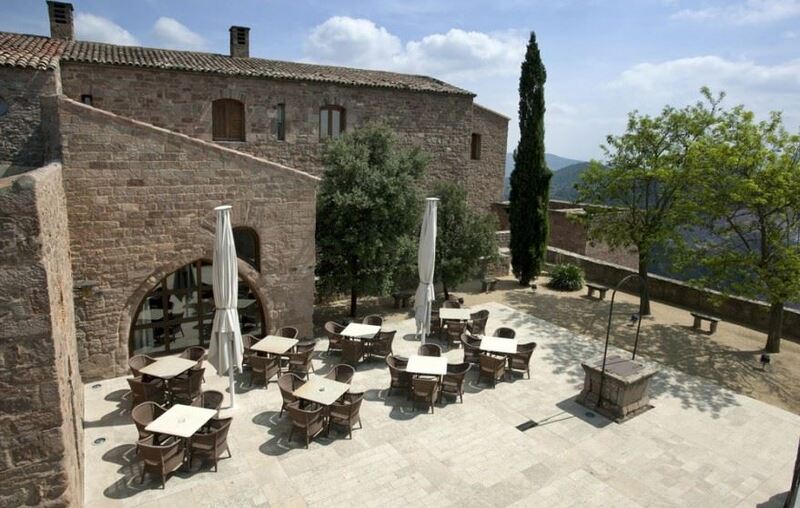 Located inside one of the most impressive of Spain’s medieval towns that dates from the 8th century, the Parador is the former house of the Barreda-Bracho family. The name Gil Blas is actually a fictional character made famous by the French writer Lesage who crafted this rogue in the 18th century. The family house dates from this same period and metamorphosed into a hotel in the 1920s at the hand of Count Guell who championed the town and invited visiting royalty to enjoy Santillana. The hotel became one of the first Paradores in 1944 and today is a great base for the nearby beaches, mountains and the amazing caves in Cantabria. Santillana is a big hit with families because the town is closed to traffic and you’ll spot many Camino pilgrims passing through on the Northern Camino trail and the Camino Lebaniego. See all our posts about Cantabria here. You can’t beat staying in a castle to forget about all the day-to-day worries and connect with the past. 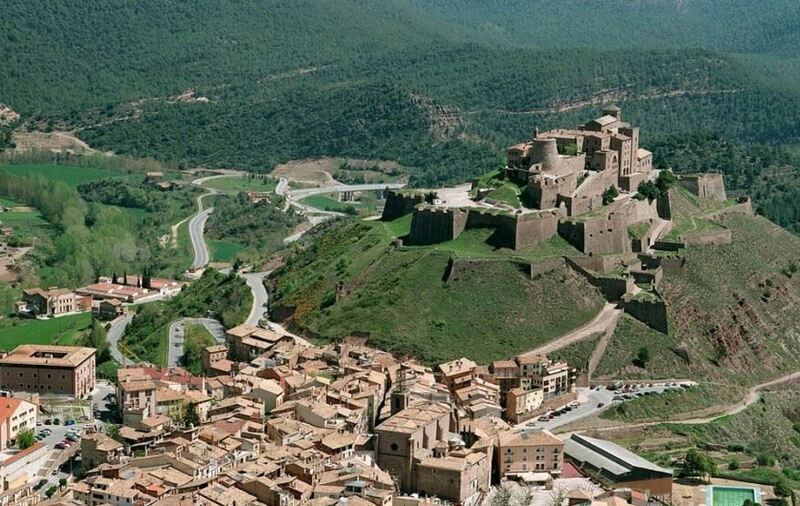 Cardona’s Parador is a stunning medieval castle that dates back to the 9th century. The Parador and the nearby town take their name from the prominent family and member of the Catalan and Aragonese nobility – their remains lie in the church’s tombs. The site is full of legend and tales – including a haunted room, a failed love affair, and a saint who is said to grant positive births to expectant mothers. The actual history of this castle which was also a prison and barracks before becoming a Parador is pretty impressive too. Enjoy the facts and the fiction and most of all, the views. Standing on a height, its modest 62,000 square metres offers views of up to 40km in the distance. It’s 85km from Barcelona city and makes a perfect weekend break from the city or part of a driving holiday in Catalonia. If you’d like to read more about this region, check out our posts on Gaudi’s Barcelona, Dali’s Catalonia, Barcelona City in 48 hours and the Costa Brava. 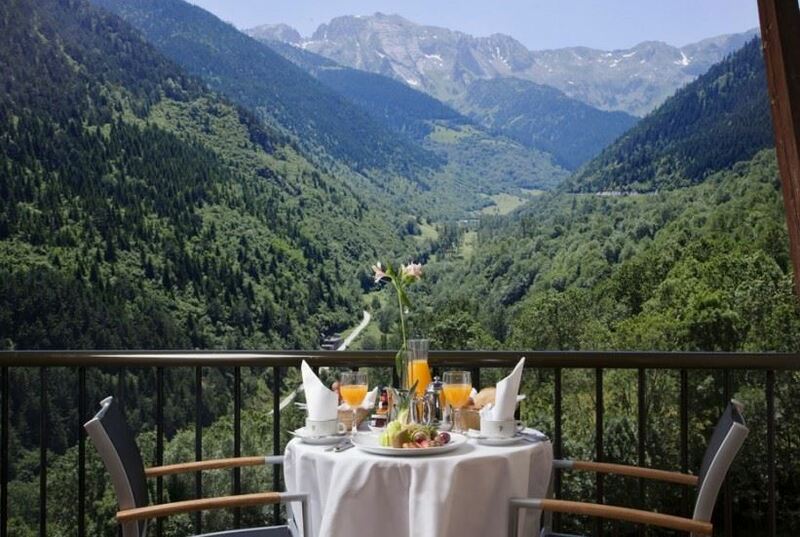 If you are looking for the great outdoors (perhaps a bit of skiing in Winter or some great hiking routes from Spring through Autumn time) and want a comfortable base with spectacular views, we recommend the Pyrenees for its landscape, its great facilities, its cuisine and the views. Vielha is a really interesting town where you’ll find an old quarter, palaces, churches, museums and artisan stores, and great bars and restaurants plus plenty of skiing and hiking stores. Base yourself here at the Parador at Vielha and visit the unpronounceable but amazing National Park at Aigüestortes which is a stunning place to observe local wildlife. We toured the Pyrenees last year with our girls and stayed at this Parador. Although Paradores are very popular with couples and small groups, they are extremely kid-friendly too. Whilst the hotel won’t win any design awards and is probably in line for a refurb soon, the spa is wonderful and the views of the Valle de Aran from here are stunning and are forever etched on our memories. And that’s the sign of a really great hotel! Read more about Aigüestortes and the other national parks in Spain here. Most impressive doesn’t cover the Parador of Lerma. 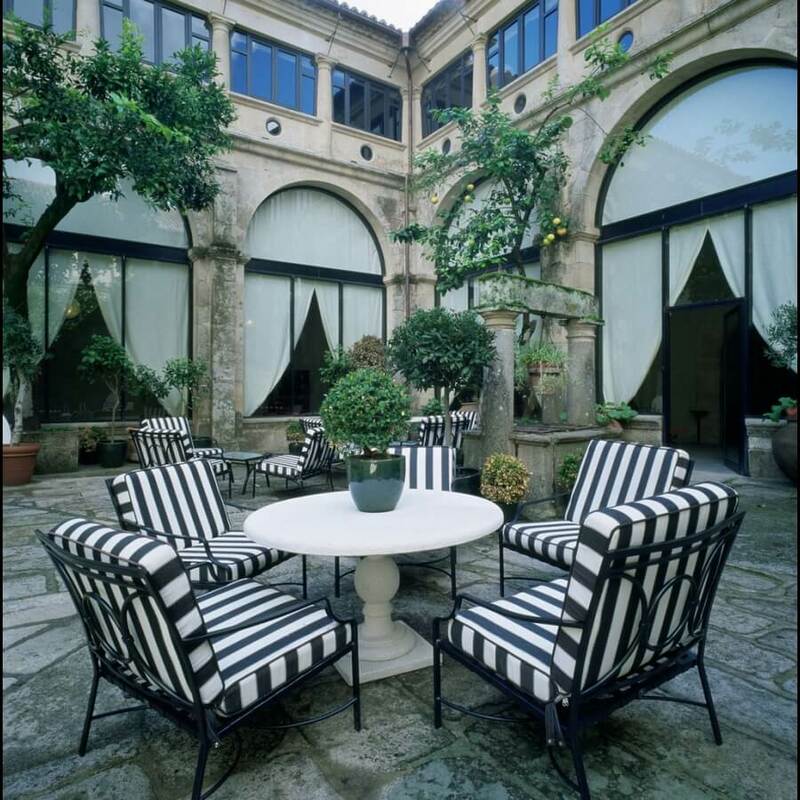 Words fail to describe this jaw-droppingly beautiful Parador that occupies an entire side of the town’s plaza. 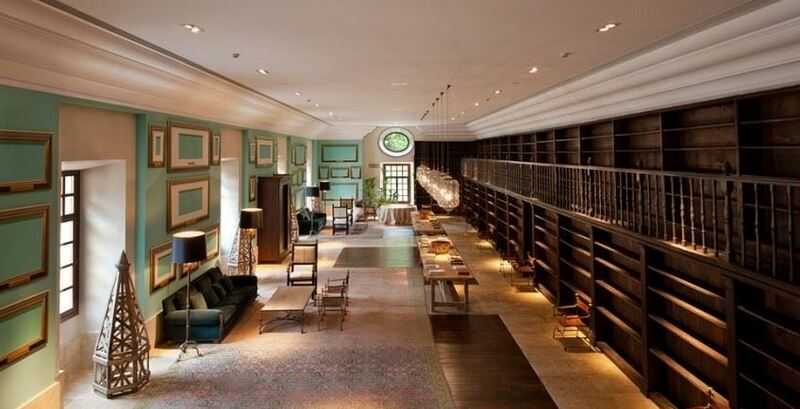 And we love the interiors too – especially the great lounge in the courtyard. 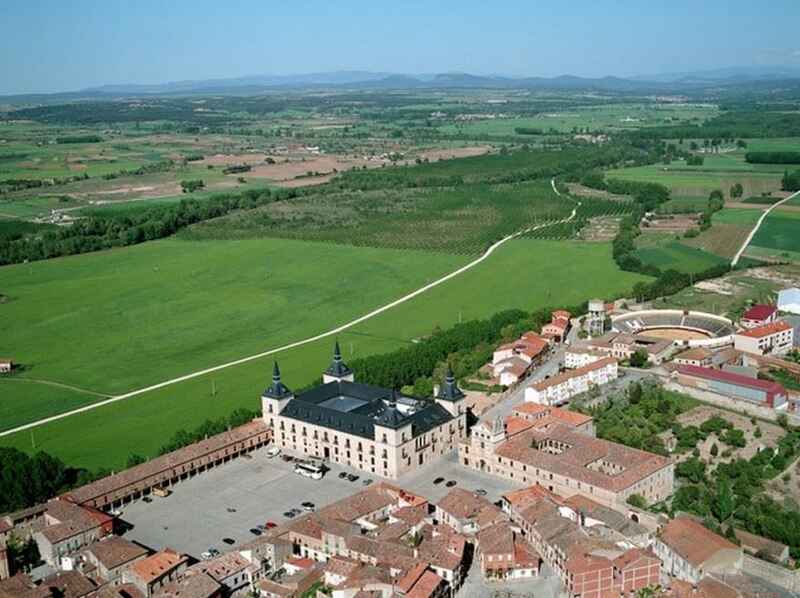 This ducal palace from the era of the Hapsburgs is a wonderful base from which to explore Lerma’s medieval quarter and there are plenty treats nearby too such as Covarrubias, the Santo Domingo de Silos Monastery, the Arlanza and the Aranda del Duero wine regions. 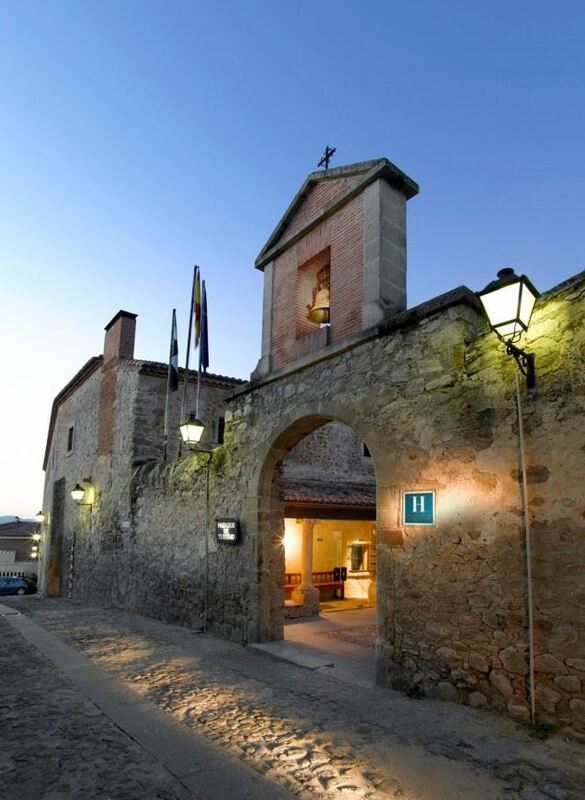 Pro-tip: this parador makes a great stopover from Madrid to the wineries in La Rioja. If you are interesting in visiting wineries, do check out our guides to the Rioja and Rioja Alavesa wine regions. 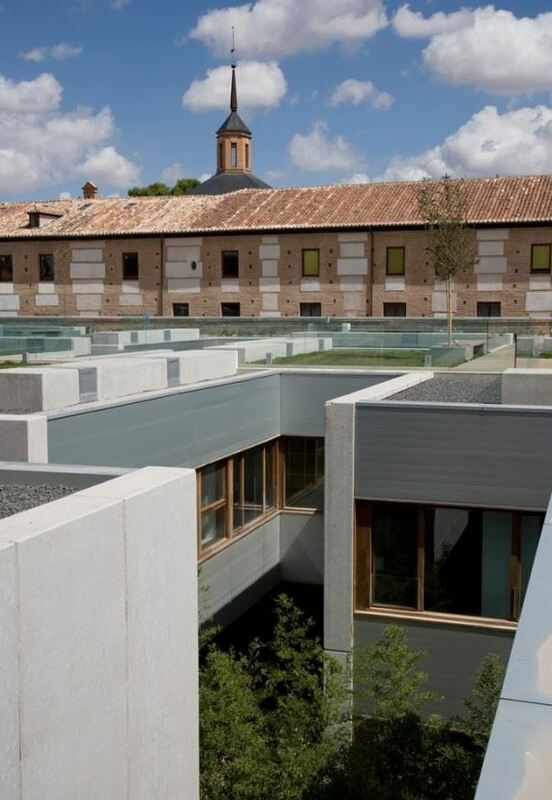 Some Paradores are in old buildings, some are purpose built modern structures and others offer a combination of both. Alcala’s Parador is a perfect example of why the latter works so well. 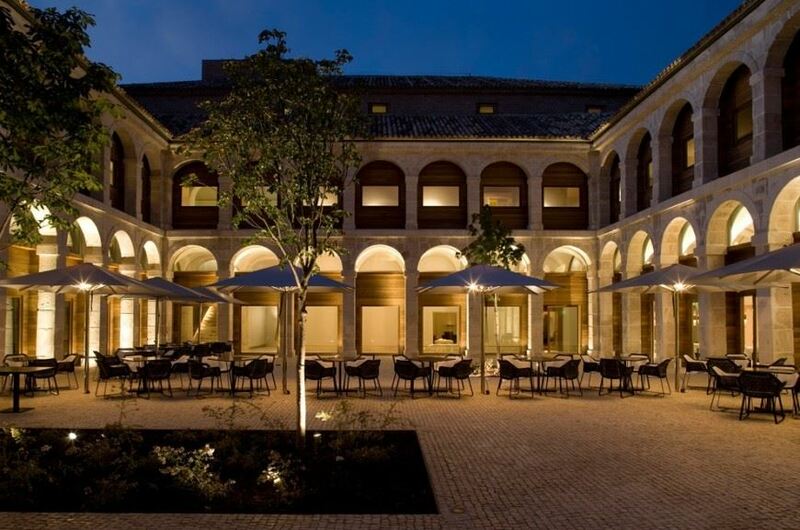 The Parador (one of the oldest in Spain dating from 1929) is a modern hotel in the very centre of an old medieval university town (the birthplace of Cervantes) – just a short drive or train ride from Madrid city. The reception, restaurant, lobby and other common areas are located in the 17th century monastery school and student lodgings known as San Jeronimo College. The bedrooms, spa and larger function rooms are in the modern extension or annex to the rear of the hotel. Convenient to central Madrid, you’ll find quite a bit to see in Alcala also – the Calle Mayor, cathedral, university buildings and Archbishop’s Palace are well worth a tour. Keep an eye out for the storks and their curious nests on the church steeples and enjoy the many literary and theatrical elements in the town including the wonderful Corral de Comedias theatre in Cervantes Square. Read more about the city of Madrid and other day trips in the region here. 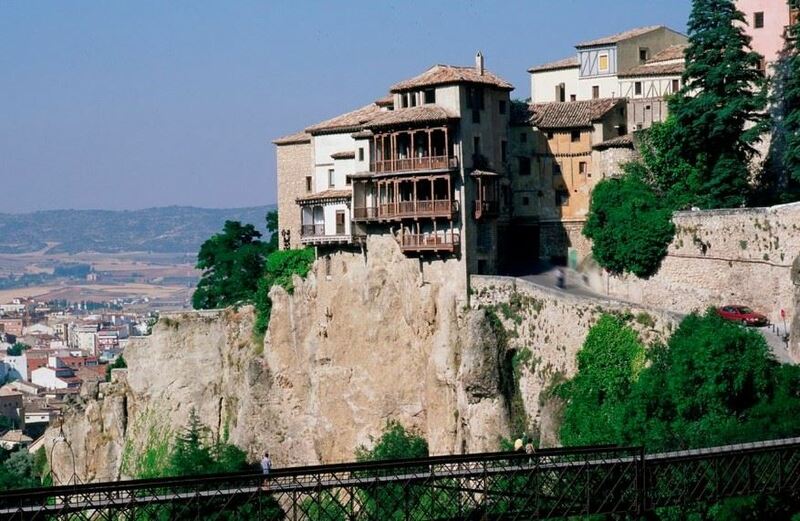 The location alone is enough to include the Parador of Cuenca in this post – the views of the ‘hanging houses’ from the hotel are the best in town! But this Parador is also a beautiful space in what was formerly a Dominican monastery and church built by Canon Juan del Pozo (his remains lie within the chapel). We love the chapel and the glass cloister is also wonderful. There is a nice feeling of continuity in the Parador, for example, the restaurant is located in the convent’s old dining quarters. Nowhere better to try the game, roasts and stews this region is famed for. The town is an interesting walkabout too – the Plaza Mayor is a pleasure to see and there’s a wonderful abstract art museum run by the March foundation inside one of the hanging houses that you should visit too. But most of all, just take in the views – that amazing panorama, the geological formations and those houses that seem to dangle from the cliff’s edge! Read more about the city of Madrid and other day trips from Madrid here. 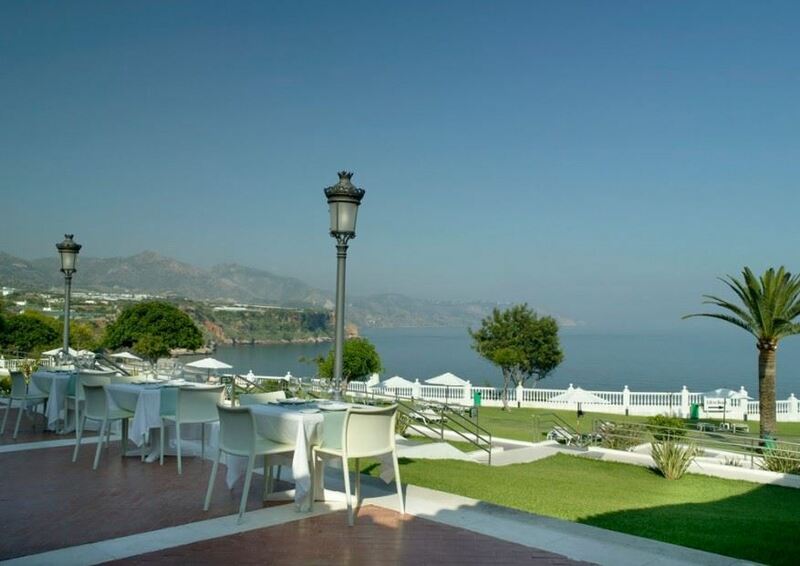 There are many great modern coastal Paradores – including the Aiguablava Parador on the Costa Brava, but we find we can’t resist the charms of Malaga’s Parador in Nerja, for its amazing location and sea-views. Built in the 1960s from a cliff’s edge (there’s quite a few of these in Spain, aren’t there? 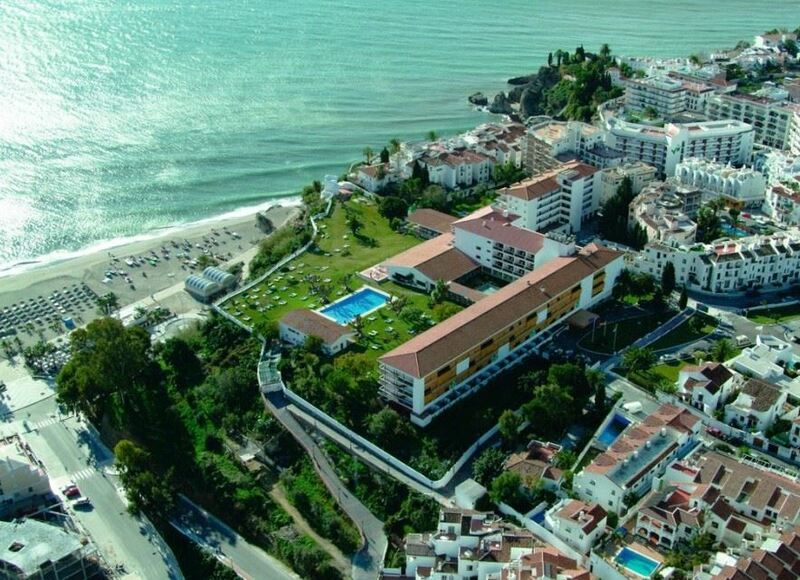 ), the Parador has been well maintained and offers a peaceful refuge from the heaving Costa del Sol. What do we love about it? The amazing buffet breakfast is great as is the superb lift that takes you from the gardens to the beach below. While in Nerja you should visit the Caves and the beaches. And Malaga city is just 50km away where you can find the Picasso Museum, the Thyssen, the CAC which is the contemporary art gallery and the new Centre Pompidou Malaga and the Russian Museums. Only half an hour from Seville, this seemingly sleepy rural white-washed town offers many clues to the history of Andalusia. Its motto is “resilient and independent” which gives you an idea of the number of conflicts on this doorstep. 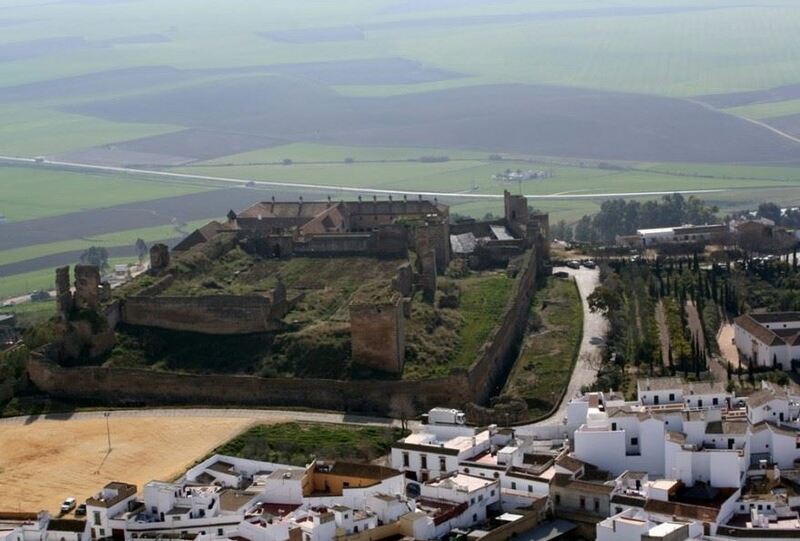 The castle started out life in 14th century Spain and witnessed events such as the Catholic Kings expulsion of the Moors and the riches from the Discovery of the Americas first hand. The Parador hotel is located in the Upper Fortress that is also known as the Fortress of King Pedro (Peter The Cruel) who used it as a love nest with his secret bride Maria de Padilla. It’s hard not to be curious about this leader and so many others when you stand inside the grounds of the castle and look out over the valleys. The castle fell into disrepair in the 16th century until the 19th century when a local archaeological society started the reconstruction work which was carried on by the Parador network who opened it to the public as a hotel in 1976. This elegant Renaissance palace in the historic quarter of Caceres – a World Heritage Site located on the Via de la Plata or Silver Way – is a little jewel to be treasured. Perfectly located down the city’s narrow streets (you’ll need to drive carefully and drop off your bags or park your vehicle outside the old quarter) to enjoy the atmosphere and colour of Caceres – the Plaza de San Mateo, Bujaco Tower and the Aljibe Arabe. The combination of the old front of house with the modern bedrooms and funky gardens make this a wonderful place to rest and restore the batteries after a tour of the city’s landmarks. And the region has lots to offer also – don’t miss the Valle del Jerte – famous for its cherry blossom – and the biosphere reserve that is the Monfrague National Park known for its birdlife and the stunning Salto del Gitano rock formation. Read more about Extremadura in our guide to the region here. 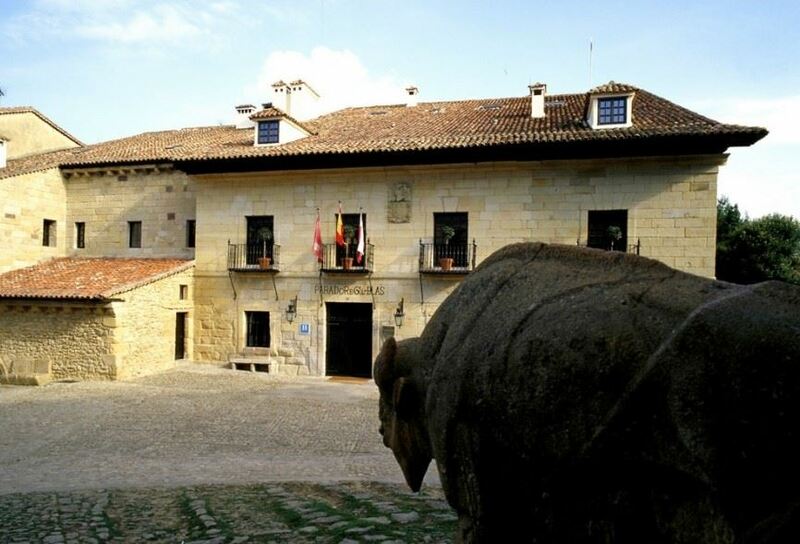 Sometimes you just connect with a place or a Parador and for us Trujillo is like that. We loved the architecture, the location, the history and of course the wonderful Parador breakfast. The town of Trujillo is also spellbinding and is the birthplace of many of the Americas’ conquistadores so there’s lots of see and learn about this period of Spain history. 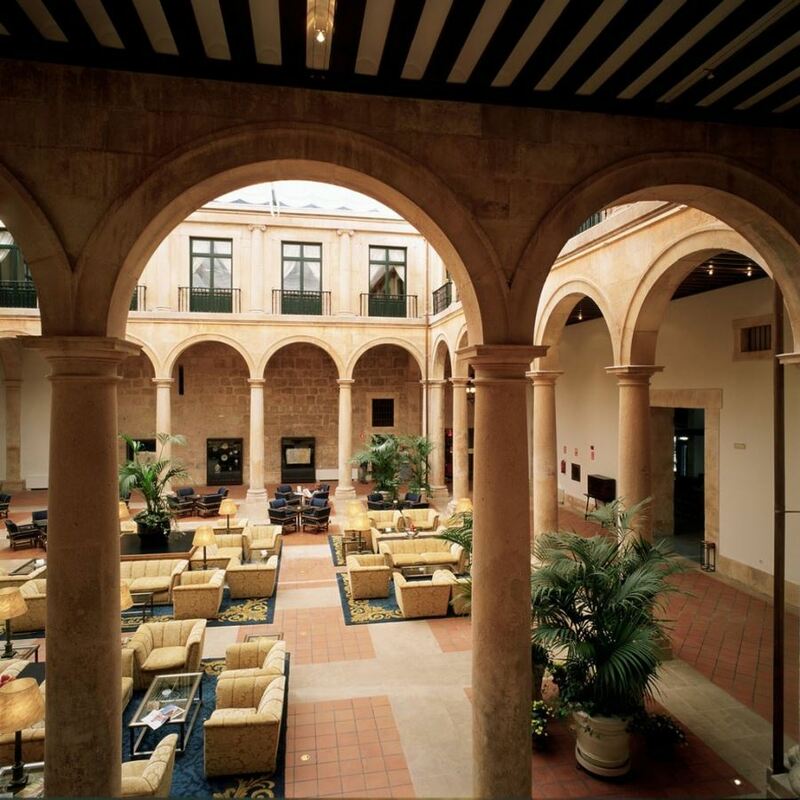 Nestled to one side of the old quarter is the Parador building, in a former Santa Clara convent from the 16th century. 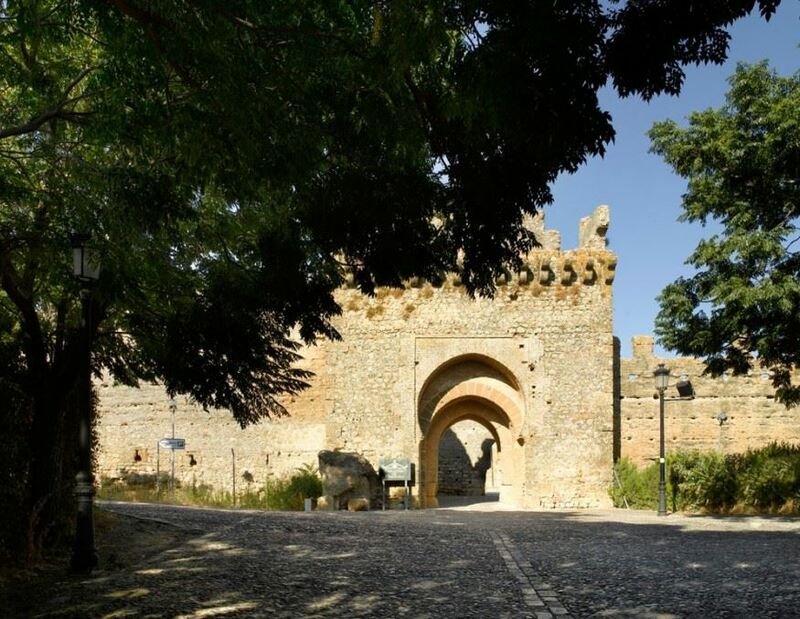 So many original features are intact – including two beautiful cloisters – which make a great place to read up on the likes of Pizarro and the earlier history when the Moors ordered the building of the town’s walls and fortress. Contemporary Trujillo has a lot to offer also – including many wonderful bars and restaurants on the lovely square. We recommend the local migas (meaning breadcrumbs) and excellent jamon which you can have out or back at the Parador restaurant – where we were putty in our chef’s hands and were all the better for it. Read more about Extremadura in our guide to the region here. Wouldn’t you like to experience what’s on the other side of this archway at the Parador in Trujillo? Posted in Accommodation, Andalucia, Asturias, Cantabria, Castilla la Mancha, Castilla Leon, Castles, Catalonia, Extremadura, Galicia, Insider Spain Guides, Madrid Region, National Parks, Paradores, Popular Posts, Useful Information and tagged architecture, Conde Nast Traveler, gastronomy, History, hotels, Parador, Spain.